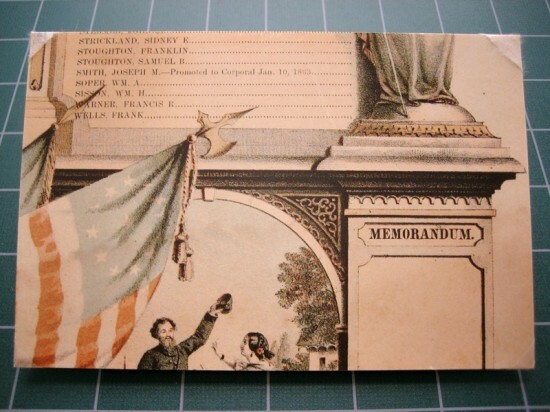 One of the best ways to promote an institution’s collections—especially special collections and archives—is through exhibitions. There are a number of points to consider when putting on an exhibition, but there are plenty of resources available on this topic, and since I don’t have any direct experience putting on an exhibit, I won’t be going into that now. (In brief: preservation!) Additionally, our hands-on work for this session was fairly straightforward, so this post is going to be comparatively brief—I’m simply going to show off the mounts I created. I’m also sorry to say that this might be the last entry in my collection maintenance series; we do have two sessions left, but those involve lectures in the morning and tours (of ACME Bindery and the MIT Conservation Laboratory) in the afternoon. I’m sure I’ll learn plenty at the tours, but unless photos are permitted (and I find myself taking them), I might not post about them here. In any case, let’s look at some custom exhibition mounts. The first thing we worked on was mounting a sheet of paper. We accomplished this with Japanese tissue and polyethylene strips. The tissue was easier to work with, but it conceals content, so in some cases the polyethylene strips work better. 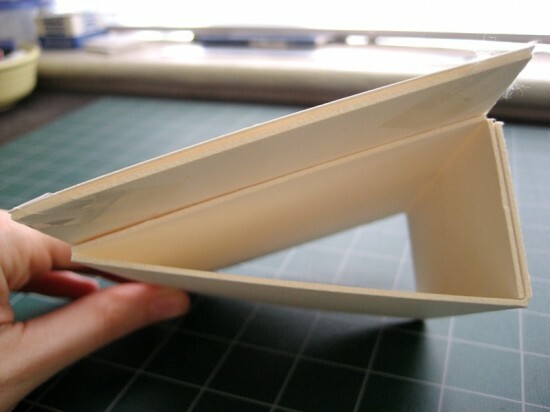 Once the paper is mounted onto the board, the wedge is created. Measurements are taken (although our board was precut), and then the board is scored with a blade up to about three-quarters of the way through, at which point it will fold nicely. Then the two ends are adhered with double-stick tape. Optionally, the board on the paper mount can also be adhered to the wedge. The mounted paper, with the wedge attached. It’s a very simple structure. Ideally, though, the wedge should be as wide as the paper’s board mount—but again, our materials were precut. 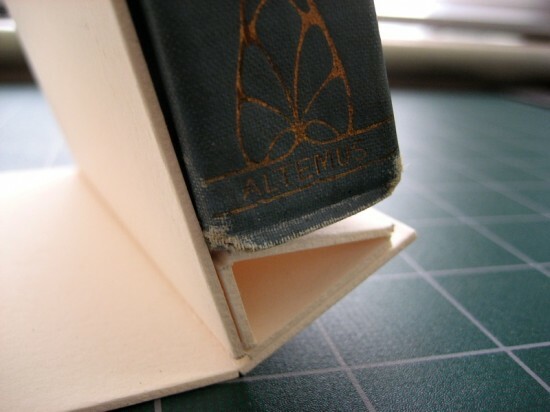 Creating a cradle involves propping the book up into the desired shape (but allowing the book to tell you how far it’s willing to open) and taking measurements. Then, as with the wedge, the board is scored and folded, only here there are both mountain and valley folds—in other words, some folds are scored on the front, and others on the back. Then the board is folded, and double-stick tape is adhered to the bottom of the spine support, which is then adhered to the inside of the base (hopefully the second image below will make this clear). The book in its custom cradle. It’s not a perfect fit (I think I overmeasured the spine a bit), but I was still satisfied with this as a first attempt. 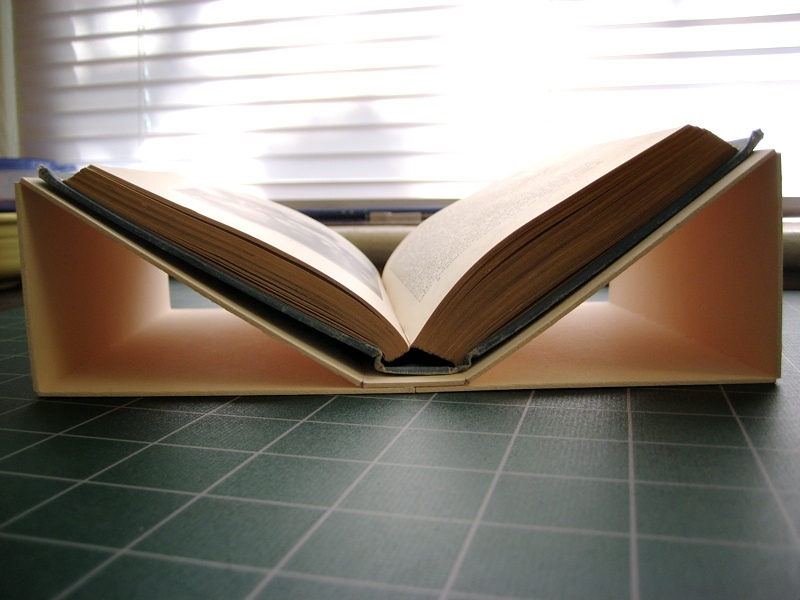 Here you can also see a page floating up; polyethylene strapping (adhered to itself with double-stick tape) can be used to hold down one or both sides of the book as necessary. 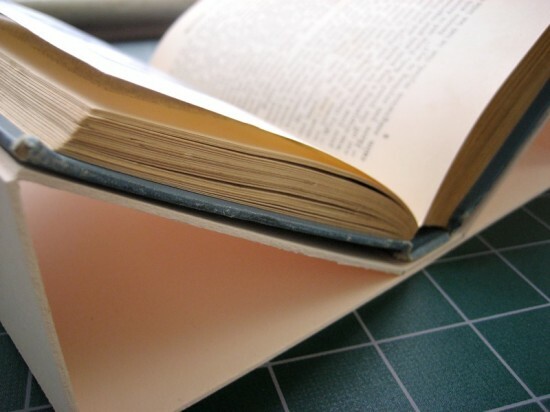 Ideally, the measurements should account for the board thickness and should therefore not be visible from overhead, but our instructions were simplified; here you can see that the cradle extends beyond the borders of the book slightly. The book in the display. This was not the angle I was aiming for; it looks like I should have made the back of the stand shorter. Instead, it’s the same height as the board that’s supporting the back of the book (which should also be shorter, so that it doesn’t extend beyond the height of the book). 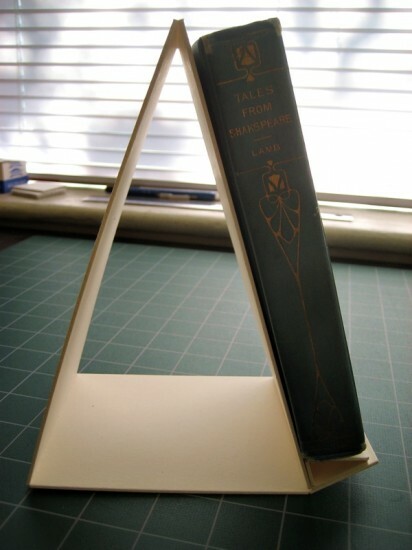 This is the same problem we ran into initially—the base support doesn’t sit at a 90° angle from the board support, so it isn’t flush with the base of the book. So, while the idea is pretty clear, my measurements need some tweaking. Despite the trouble, the thought process behind designing the mount and then making alterations when it was found to be insufficient was really interesting (and, I’m not ashamed to say, rather fun)—not to mention great experience, since that reasoning skill is exactly what I’ll need on the job. Who said English (and library science) students didn’t need to understand basic geometry?